Here’s an intriguing photograph. Our latest spy shot shows KTM’s new V-twin Super Adventure prototype being tested alongside an existing BMW R 1250 GS. 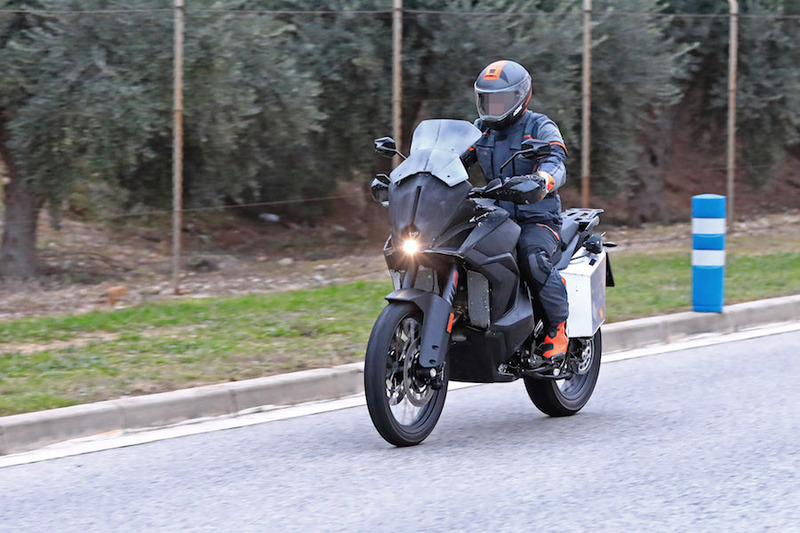 KTM has a reputation for “thin twins” but the rather bulbous fairing hints at major changes. We suspect it’s running the new, more powerful 1301cc “1290” engine. Certainly, the current Super Adventure’s single radiator has been replaced with two side-mounted units, with the front cylinder head poking out between them. That also suggests the wheelbase has been shortened a fraction, with weight bias moved forward. The extra width created by those side-mounted rads continues in a large and very wide belly fairing below. We think it will house the fuel tank in a similar fashion to the new 790 Adventure. At the moment the V-twin prototype has its tank – or perhaps it’s an additional tank – bolted to the back left-hand side like a pannier. Clearly a temporary arrangement, it means the fuel pump dangles below and there’s a poorly-fitting filler cap on top. The new front bodywork also clearly shows the conventional fuel filler in front of the rider. We reckon KTM plans to use a pair of side-mounted fuel tanks fitted below those new radiators. They will need to be carefully-engineered, probably moulded from fuel-proof plastic, and may not be ready to test yet. Putting the fuel down in the front bodywork will lower the centre of gravity, making the bike feel lighter to manoeuvre. It also clears a significant space in front of the rider, allowing the seat to extend forward more and be lower and narrower, making it easier for riders to get their feet down. This will overcome the major challenge facing designers of big off-road bikes with long-range fuel tanks. But it will mean a KTM V-twin that’s as wide as a Boxer twin.